Tunnel Vision is an expert, highly experienced CIPP lining company. CIPP (cured-in-place pipe) is manufactured underground in the field to accomplish trenchless rehabilitation of sewer, storm and industrial pipes; essentially, CIPP becomes new pipe formed within the existing, compromised pipe. Cured in place pipe repair is by far the most reliable method of industrial and sewer pipe rehabilitation. As an expert amongst CIPP lining companies, Tunnel Vision Pipeline Services has been doing the work successfully for many years in some of the most challenging environments possible. Why UV-Cured CIPP? Traditional methods of pipe rehabilitation do not have a QA/QC system other than a single temperature data point at the exposed end of the installed liner. There is no assurance that a full cure was completed throughout the entire length of the pipe that is being lined, making it difficult or impossible to know if the liner will be installed as structurally-intended. Uncured resin eventually washes away downstream into the environment, taking liner strength along with it and leaving behind a porous, structurally-deficient liner. UV-cured pipe liners and CIPP sewer repair technology overcomes this problem via a full end-to-end, integrated QA/QC and has proven its value consistently over the last two-plus decades. Protect your capital investments by ensuring every foot of your investment is installed as designed and intended – with full strength, no resin washout, and no porosity. 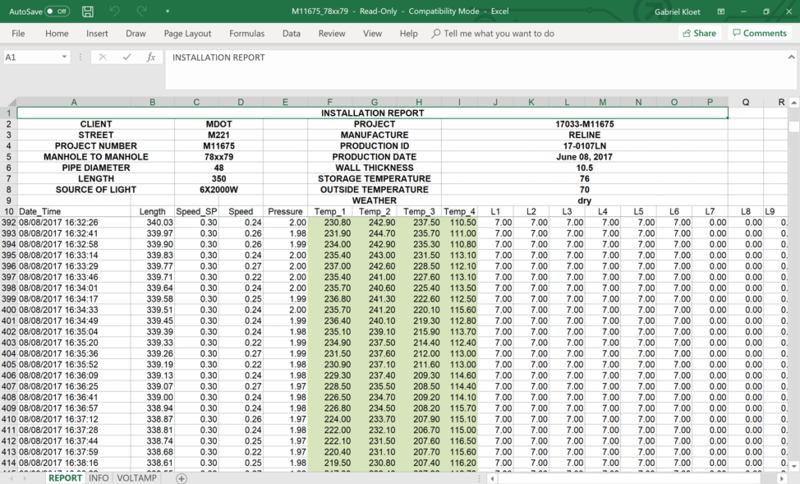 Tunnel Vision conducts CIPP relining with a full quality tracker, which records the cure temperatures and internal pressures of every foot of every installed liner. Our CIPP pipe repair system includes a full video recording of the cure as it happens — a substantial improvement in quality assurance for high-value capital improvements. Our dry-cure system involves no cure water or steam. This eliminates styrene smell, washout risk, resin slugs and disposal (or, in many cases, full release into surface waters) of hot, sytrenated cure water. All resin is fully encapsulated within the liner, greatly reducing or completely eliminating risk of styrene and VOC exposure. POur CIPP pipe repair requires relatively little equipment and energy, involves no digging, and overall has minimal impact on the environment. Tunnel Vision uses ISO 9001-certified Reline™ ALPHALINER® UV CIPP Liners in our work. This GFRP (glass-fiber reinforced plastic) material has much better mechanical characteristics and a thinner wall thickness than standard CIPP liners due to its strength (nearly 2M psi modulus of elasticity), ensuring a durable finished product that will last for its projected design life or longer. Even wall construction and thickness equates to uniform structural performance in the liner. Consistent glass fiber placement makes installation more efficient by eliminating concerns about material overlap. CVonstant, predictable circumferential and longitudinal stretch behavior adds efficiency to the installation process and assures a consistently strong rehabilitated pipe section.